Eyelash extensions have been around for over 60 years, but are the latest crave for embellishing the eyes. Lash extensions instantly create the 'mascara look' without using any. They mimick the appearance and weightless feel of your own lashes, therefore resulting in a natural and luscious look. Lash extensions are known as "semi - permanent" eyelashes as they can remain in place for the natural cycle of your eyelash itself. 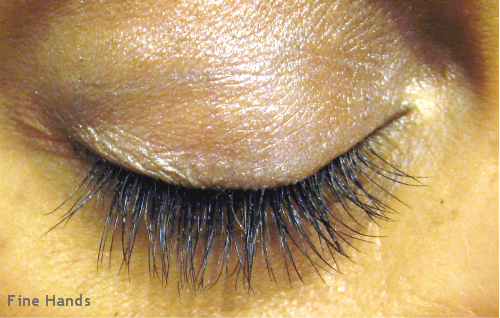 A natural eyelash cycle typically sheds every 60 to 90 days and is naturally replaced with the growth of a new eyelash. As your natural eyelashes shed, your extensions will as well. Because of this cycle, fill in appointments every 2 to 3 weeks are recommended to keep up with the natural growth and shedding of your lashes. The cost of eyelash extensions vary throughout the country, but are typically priced between $150 and $450. A fill in is normally a small fraction of this, depending on how many lashes need to be replaced. Eyelash extensions are single synthetic lashes that are applied one by one to your existing lashes to make for a natural look and feel while adding length, and volume to your own eyelashes. Eyelash extensions are great for everyday wear, or for a special occasion. Eyelash extensions remain for the full life cycle of your existing lashes, generally lasting between 4 to 6 weeks. The life cycle of natural lashes vary per individual, and factors such as your lifestyle, moisture and general care of your eyelashes will affect their longevity. Fill in appointments every two to three weeks are recommended to keep up with the natural growth and shedding of your lashes. Do not be alarmed if some of your lashes shed quickly (they most likely were at the end of their cycle) as each of your eyelashes is at a different stage of its life. A full set of extensions may take up to two hours or more. A fill in usually requires less time depending on the condition of your previous application and lapse since your last visit. Can you decribe the application procedure? You will be comfortably reclined with your eyes closed during the whole process. Up to 60 eyelash extensions will be applied per lash line (depending on the number of available natural lashes) to create a look of fullness. 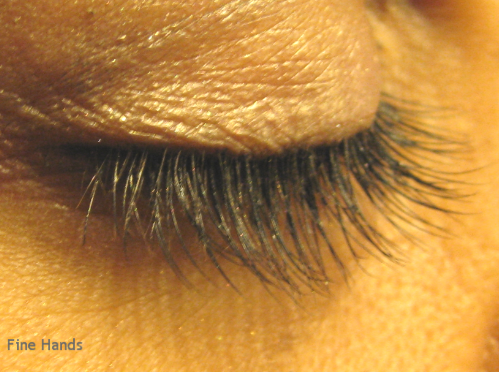 Many clients are so relaxed they wake up to beautiful lashes. A fill in can be done in as little as 30 to 60 minutes. Most people find that mascara is not necessary, as this is one of the main advantages to wearing eyelash extensions. The eyelashes already provide the ultimate length, thickness, and fullness you desire along with a nice curve. However, ONLY WATER BASED MASCARA may be used if you feel the need for a further enhanced look. You can wear eyelash xtensions without hesitation. You can shower, swim, or spa while wearing them. However, it is important to keep them dry for 48 hours immediately following the application. After investing your time, you'll want to make sure to follow these easy care instructions to maintain your new look. ~ Avoid rubbing your eyes or using products around your eyes, particularly creams containing oils that will cause your lashes to fall off prematurely. ~ Do not use regular or waterproof mascara. Other brands of mascara contain chemical properties and oils that will break down the adhesive. Apply mascara to tips only. ~ Take special care around the eye area when cleansing your face. Gently cleanse the eye area and do not scrub or rub your eyes. ~ Do not attempt to remove the extensions yourself. You most likely will pull out your own eyelash. Have them removed by your professional eyelash technician. ~ Be sure to schedule your fill in appointment every two to three weeks to keep your lashes looking full and natural. ~ Call with questions or concerns. Join our mailing list to receive time to time promotions on eyelash extensions. If you wish to schedule an eyelash appointment, please call Corrin at 510.798.7737 or send an email via the contactform. Your questions and queries are welcomed.